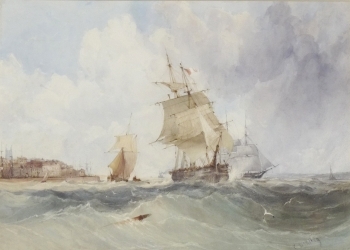 A marine artist who was apprenticed to the engraver Theodore Fielding. He started engraving on his own behalf on the termination of his apprenticeship in 1827, & for some years combined engraving with watercolour painting. He was elected Associate member of the Old Watercolour Society in 1834 & a full member of the Old Watercolour Society in 1843. Examples are in the British museum; Victoria & Albert Museum & elsewhere.